Last week I began a four-part series on night sweats, a problem which many find very troublesome. In that article, Night Sweats? No Sweat!, I discussed estrogen and testosterone deficiencies as a possible cause. Today I'm going to discuss another common cause affecting people, particularly those with fibromyalgia: adrenal issues — a condition that not only causes night sweats, but also difficulty falling asleep, and waking in the middle of the night. You're irritable when hungry (often to the point your crankiness triggers relationship problems). Your mind seems wide awake at bedtime. This is often because your cortisol levels, despite being too low during the day, are too high at night. If this sound like you, taking a supplement called Adrenaplex® in the morning and Sleep Tonight™ at bedtime can be life changers in many beneficial ways (I explain more about this below). 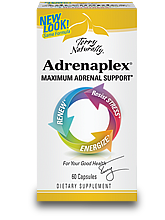 Adrenal exhaustion is a common condition caused by the stress of modern life. Estimates are that it affects 16% to 67% of the population at varying levels of severity. The adrenal is your body's stress handler. You probably learned about the "fight or flight" response to stress in grade school. When you're under threat of attack, your adrenal glands fire to raise your blood sugar to supply quick energy to fight or run. In distant human history, this might have occurred every couple of months. But today, with the increased hustle of modern life, fight or flight can be triggered dozens of times a day! This frequency of stress can exhaust your adrenal glands, and cause a malfunction in their normal day/night cycle behavior. With adrenal fatigue, your blood sugar levels repeatedly drop during the day. This causes moodiness, fatigue and anxiety, which can leave you feeling completely stressed out. Sadly, most physicians aren't trained to look for and treat adrenal fatigue. They're only trained in illnesses that destroy the adrenal gland (Addison's disease), which only affects one in 10,000 people. The easiest way to tell if you need adrenal support is if you get irritable or angry when hungry, a condition often referred to as being "hangry." I've seen many couples who've developed relationship problems because one or the other becomes "hangry" unpredictably. In these cases, treating the underlying adrenal fatigue often repairs the relationship. And at 40 cents a day, this is a much better approach than marital counseling or divorce lawyers. Fortunately, this cycle can be easily broken. Supplementing with adrenal glandulars, vitamins C and B5, licorice and tyrosine will usually take care of the problem within a week. All of these can be found in combination in Adrenaplex® (for just 40 cents a day). In addition to helping the night sweats, anxiety, moodiness, stress and fatigue, this also decreases your sugar cravings which, along with the stress, worsens adrenal fatigue. You'll also feel more energetic and improve your stamina if you increase your salt, protein and water intake, eat frequent small meals, and avoid excess sugar. If in addition to having some of the other symptoms I've described you also feel like your mind is wide awake and "wired" at bedtime, then you probably have a malfunction in the day/night cycles of your cortisol level. This is when your cortisol adrenal stress handler hormone is too low during the day and too high at night. But then it also plummets in the middle of the night, causing your blood sugar level to drop and leaving you wide-awake with night sweats. If this is the case, try eating a 1-2 oz high-protein snack at bedtime such as a hard-boiled egg or some cheese, meat or fish. Don't eat anything sugary or high in carbohydrates as that will actually make the problem worse. You'll know if this is helping after one or two nights. 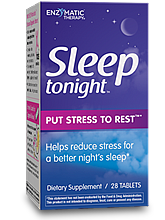 Taking the supplement Sleep Tonight™ an hour or two before bedtime can also help. This mix of ashwagandha and phosphatidylserine will lower your cortisol levels so your brain can shift into sleep mode (it can be taken with any other sleep supplements or medications). Before your adrenal glands hit rock bottom, they can cause you to go through a period when the normal day/night cycle of cortisol, called the "circadian rhythm," reverses. Instead of being high during the day as they should be, your cortisol levels are too low, leaving you feeling exhausted. And instead of being low at bedtime, which is critical if one is to fall asleep, your levels are too high, leaving you wide awake with your mind racing. What can you do? I've found that if you try taking Adrenaplex® (in the morning) and Sleep Tonight™ (1-2 hours before bedtime) for a few days, and you find that it helps, then you probably have reversed cortisol levels. It's not only a better indicator than any medical test you could take, but it also takes care of the problem! If you'd like to see if you might benefit from adrenal support, try taking the Energy Analysis Program, a 10-minute quiz that can analyze factors impacting your energy level. Meanwhile, give yourself permission to quit doing some of the things that feel bad in your life. Learn to say no to things that don't feel good. You can blame it on me — just say it's doctor's orders!